A prior fracture of the anterior talar process is presented in this 19-year-old. This is an anatomic test that might stress even the most experienced. Your challenge is to name the three ligamentous structures, or three structures that are identified in blue, pink, and orange. 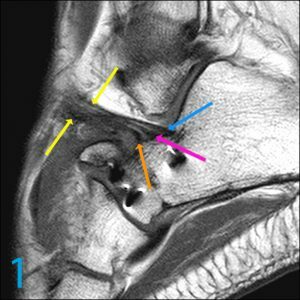 The three structures combined represent the inferolateral retinaculum of the subtalar space or sinus tarsi. The strong cervical ligament is more medially-positioned. Most medially-positioned in the sinus canal is the talocalcaneal interosseous ligament. The three substructures of the inferior retinaculum are not often seen this well, and they include the medial bundle in blue, the intermediate bundle in pink, and the lateral bundle in orange. The lateral bundle also sometimes goes by the name stem ligament. Another uncommon name given to it is the “frondiform ligament”. The distal aspect of the retinaculum identified in yellow does look like the end of a celery stalk or frondiform in shape. If you knew this answer, you deserve a glass of high-quality wine.